With the June 3 Primary set for next week, the contest among the five Republicans seeking their party’s nomination for the U.S. Senate is heading into the home stretch. Democrat Tom Harkin announced in January of 2013 he would not seek reelection, Now, a year and a half later, political observers say campaign ads have helped two of the Republican candidates for Harkin’s seat sprint ahead of the pack. Candidate Mark Jacobs, a former energy company executive, moved back to his home state in retirement. “The Iowa values that brought me success in the business world now compel me to enter the political world,” Jacobs said in his first ad last fall. This spring Joni Ernst, a state senator who is the commander of an Iowa National Guard unit, vaulted into the national spotlight with her first campaign commercial. “I grew up castrating hogs on an Iowa farm, so when I get to Washington, I’ll know how to cut pork,” Ernst said in her first ad. Iowa State University professor Dianne Bystrom conducts research on campaign ads. 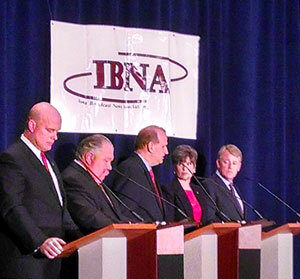 All five candidates have appeared together in three dozen forums over the past several months. They’ve universally criticized Bruce Braley, the Democrat who’s lined up to be his party’s nominee for Iowa’s senate seat, rather than pick at one another. “I think we all have a lot in common,” Sam Clovis said during a candidate forum in Cedar Rapids. Clovis, who is a Morningside College economics professor, describes himself a “full-spectrum” conservative. “I find it very difficult to believe that anyone can be too conservative,” Clovis said in late April during a forum broadcast on IPTV. Matt Whitaker is a former federal prosecutor who touts his role as a small business owner. Scott Schaben, a first-time political candidate who is the sales manager at a car dealership, has argued his rivals won’t appeal to the independent voters they’ll need to win in November. “You’re seeing some people are nothing more than professional talkers,” Schaben said at the conclusion of a forum in Bettendorf last week. To win the nomination, a candidate must secure at least 35 percent of the vote in primary or the GOP nominee will be chosen at a convention. University of Iowa political science professor Tim Hagle says a nominating convention is a real possibility in this race.